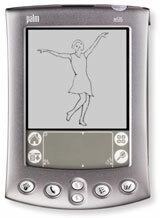 Technology provided by palmOne, Inc. with additional support from hi beam and the New York State Council on the Arts. Tap could also be seen and beamed to your palm through July 27, 2002, at five public locations in NYC. Please visit www.creativetime.org for more information. Special thanks to Falch.net for use of their DeveloperStudio for Palm OS, New York City Ballet, San Francisco Ballet, Brooklyn Brewery, Stephanie Jun, Andrew Kossow, Greg Niemeyer, Merrill Falkenberg, and Ezekiel Sanborn-Deasis.